The RSD Berlin gloves make no compromise. Their sturdy cowhide construction is backed up by armoured knuckles and reinforced palms and sides of the hand. The protective part of the palm is continued on the side of the hand and even the wrist has an extra padded and reinforced protector. The fingers have elastic stitching to ensure an articulated, ergonomic fit that allows you optimal dexterity when controlling the bike. Subtle perforations of the leather between the fingers allow some airflow on hot days and a velcro wrist tab keeps the glove in place. 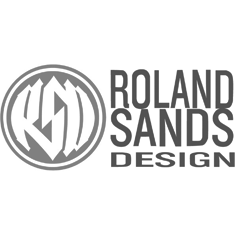 Roland Sands Design hit the spot with the Berlin, making a glove that offers loads of protection and tons of style.